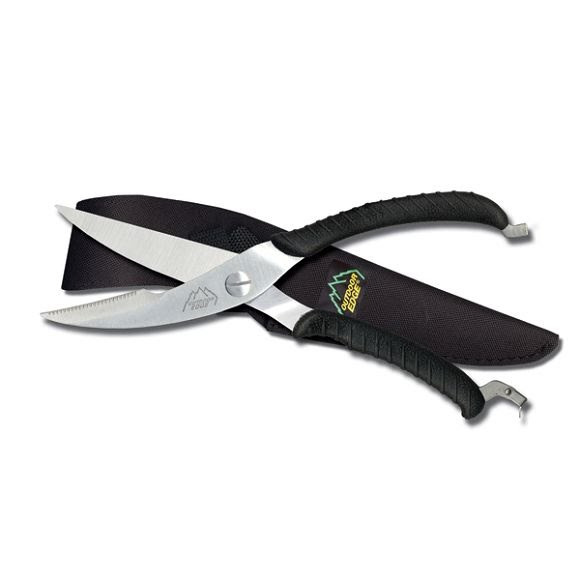 Outdoor Edge's heavy duty Game Shears make easy work of field dressing birds, small game and fish. These shears feature full tang 420 stainless steel construction, durable Bakelite handles, spring-action, serrated cutting edge and special bone breaking notch. Complete with Cordura Nylon sheath. Outdoor Edge &apos;s heavy duty Game Shears make easy work of field dressing birds, small game and fish. These shears feature full tang 420 stainless steel construction, durable Bakelite handles, spring-action, serrated cutting edge and special bone breaking notch. Complete with Cordura Nylon sheath.